The First Presbyterian Church of Whitehall closed its doors in July. A small congregation of Presbyterians is currently without a full-time home. 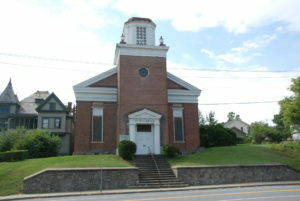 The First Presbyterian Church of Whitehall closed its doors in July, after the Albany Presbytery – which oversees the church – became aware of some code issues at the church, which was built in 1848. “What we were told was that the Presbytery became aware that it had several churches in the North Country that are very old and that they needed to be responsible for them,” said Carol Greenough, treasurer of the First Presbyterian Church of Whitehall. In July a meeting was held with the congregation, Rev. Jerry McKinney, who is the minister of the Granville Presbyterian Church, and members of the Albany Presbytery, who inspected the building. At that point, Greenough said, it was determined that many parts of the building did not meet code, including the ramp at the back of the church, the heating unit in the congregation room, the fuel tank, the bell tower and some lighting issues. In 1931, New York State widened Broadway, and cut into part of the church. Greenough said that may have had an impact on some of the code issues at the church. After that, a special meeting was called for the entire congregation, which totals about a dozen people. Greenough said all members of the congregation were determined to remain Presbyterian, and “there was no dissent” about it. When the congregation moved out, members were originally invited to conduct their services at the United Methodist Church, but Greenough said it was determined that the Presbyterians wouldn’t be able to keep a Presbyterian presence. So the congregation began looking at other options. The Presbyterians decided to reach out the Episcopal Church, which has a similar-size congregation. The Episcopal Church welcomed the Presbyterians with open arms. Currently, the Episcopal congregation worships on Saturday nights and the Presbyterians on Sunday morning, which allows each to still have its own presence and rituals, Greenough said. Members of the Presbyterian Church moved all the vital necessities to the Episcopal Church and were able to take some mementos from the building. At that point, an auctioneer was brought in to auction off other goods which weren’t of use to the church. The proceeds from the auction will benefit the Presbyterian congregation. While there is no set-in-stone plan for the church yet, Greenough said, “there was no indication that there would be a demolition of the building.” The hope is that the move will be temporary and that the congregation will eventually be able to return to its own building. For the time being, members of the congregation will work together to “keep a Presbyterian presence in the community.” Greenough said that will include continuing to contribute to the food pantry, and hopefully becoming closer with the Episcopal congregation. The Albany Presbytery did not return a message asking what the plans were for the First Presbyterian Church of Whitehall.